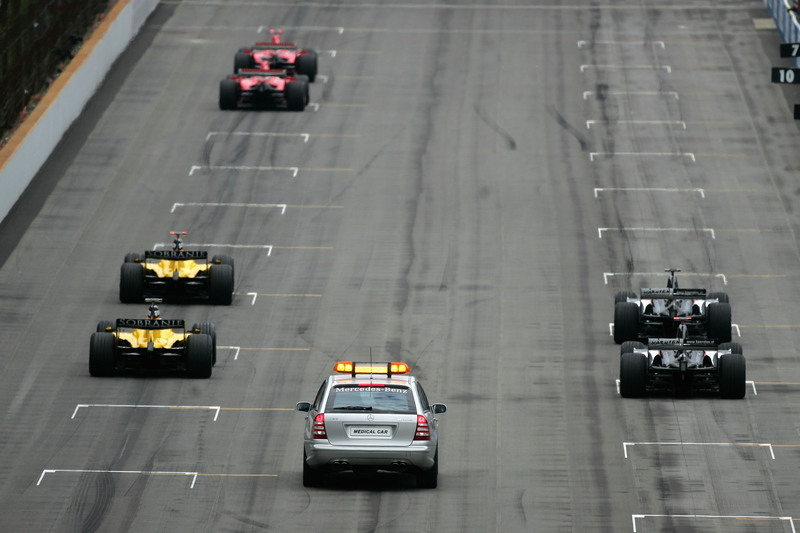 Only six cars lined up on the grid for the 2005 US Grand Prix in Indianapolis. Over recent months, Formula One supremo Bernie Ecclestone has given the biggest hint yet that the sport may be returning to American soil, confirming his hopes to stage a U.S. grand prix again by 2012. But given the country’s troubled history with F1, does the country even want it to return? F1 hasn’t always been so unpopular in the United States. America’s first ever Formula One grand prix took place in California in 1959, inspiring a generation of homegrown drivers to compete on the international stage, including its only world champions, Mario Andretti and Phil Hill. The race has been held at various locations across the country, from Florida to Phoenix, to Las Vegas’ Caesars Palace, before settling at the legendary Indianapolis Motor Speedway ten years ago. And the Speedway, which hosted the last U.S. Formula One race, can also boast the largest ever attendance at a grand prix of 225,000. But there is no doubt that in recent years the United States' relationship with F1 has become somewhat strained. The 2005 Michelin tire fiasco, which led to half the teams boycotting the race and leaving just six drivers left to compete, did little to endear the sport to its American audience. And many believed that the 2007 Indianapolis Grand Prix would well and truly be the last. However, speculation has been rife for sometime now that the F1 powers that be were planning another attempt to crack the American market, after Indianapolis race organizer Tony George was spotted at the Chinese Grand Prix earlier in the year. The Liberty State Park in Jersey City, which boasts a back drop of the impressive Manhattan skyline, was earmarked by Ecclestone as a potential location. But despite being just one of many possible venues, the idea for a New York F1 race sparked protest from the parks owners and from Jersey’s mayor and talks between the two parties came to nothing. In the end Ecclestone reached an agreement to host the US Grand Prix in Austin, Texas - one of America's most fashionable cities and the centre of the US technology industry. A purpose built track is be constructed in the city, which is now committed to hosting an F1 race for ten years from 2012 to 2021. But Ecclestone will still face a struggle to generate interest in F1 in America. His main obstacle comes in the form of the popular NASCAR and IndyCar racing series which, after American football, are the most watched sports in the country. Andretti, arguably the nation's best-ever F1 driver, has said that many of the NASCAR and IndyCar drivers have F1 potential, but are content to settle. And it looks like many American motor racing fans have now done the same. America’s indifference to F1 is further highlighted by the recent failure of the newly- created US F1 team (which was set up to promote the sport across the States), to line up on the 2010 grid. So it seems that there is a long way to go before America embraces F1 in the same way that the rest of the world already has, and at this point it is by no means certain that the championship will even make a comeback in the US. But if Ecclestone can succeed in rejuvenating the US Grand Prix in a new iconic location, could the American people’s attitudes to F1 change for the better? Only time will tell. Ya kno, Formula 1 just does not have the American personalities that NASCAR has. I think thats why soccer is so small here. The best players are all foreign. America likes doemstic heroes and domestic sports. americans only like sports they r good at, golf, tennis,basketball, baseball, nascar and americans foot ball. F1 is the pinicle of motor racing hands down. The only reason why so many flock to nascar is to watch the wrecks. F1 is the gentleman racing league. I cant wait for them to return to the US. Its hard for a sport to be popular when there are no domestic contenders. As a German I have to say I would have never started watching F1 without German drivers like Schumacher and Vettel. It takes time to for a sport to become popular and it usually takes a homegrown talent to get people pumped up about a sport. Only then does the public start to get interested in foreign drivers. @Dave: you're right, F1 is what driving is all about. I never got the whole NASCAR idea of driving in an oval for a couple hundred rounds but then I also find baseball and american football mind numbingly boring. Americans will respond to Formula 1, but F-1 will have to make that leap of faith and show up. Sure NASCAR dominates, but it's so "in-your-face-everywhere" that you're almost compelled to watch and go to a race; it's so damn accessible. A single race in the U.S. (as for almost all GPs) would see a full house for ticket sales in the U.S. I think. Americans love technology, cars, competition and they love F-1, it's just not as accessbile. At least we have the Speed Channel!! As far as NASCAR, I think those fans like something a little different than true auto racing. Don't get me wrong, those guys are great racecar drivers, but NASCAR ain't good racing; no brakes, no shifting, no right turns, and sometimes no throttle changes! Same goes for the Indy 500...our greatest race??? Gimme a break! The Rolex 24 and the future USGP should be our greatest races. They won't be, but I think they showcase real race driving. Sure, the Indy 500 has 100 years under it's belt, and that's cool, but real race driving it ain't. You don't go to a football game just to watch each team going back and forth kicking field goals. So why, then, is oval racing such the rage? Every country's premier race series is true road racing, except the U.S. Tell me NASCAR fans wouldn't dig the hell out of Australia's V8 Supercars! F-1 come on over and stay a while! I'll be there!! Bring it back to Watkins Glen (update the track & spectator stands)... or back to California. Nothing wrong not have having the over-the-top mega fanfare attached to the sport. As mentioned before... it will grow. Actually, the over-the-top egotistical fanfare actually hurt it. I think the problems with F1 in America are numerous. However, probably most problematic is the choice of location. With only one race per country, America is ripe with options. What do the organizers do, go for the money, go for the racing, go for a respectable track, .... They usually go for the money, which in my opinion usually doesn't make for a great race. I think that the great thing about F1 in many places around the globe is that the races are held on each of the countries best race tracks, here that isn't the case. If it were, probably Road Atlanta, Laguna Seca, or Mid Ohio would be the place of choice. I really think that putting attendance and money at the front of where a race is held is not the way to have a great race, and draw large crowds. What is wrong with the U.S? i love racing of all kinds. i watch V8 Supercars, Nascar, F1, A1GP, sports cars, dirt cars, blah, blah, blah. F1 is the technologically advanced Motorsport on the planet. it is exciting and intriguing. anyone who watches racing for the racing appreciates it. i don't see any lack of enthusiasm for it over here in the states. SpeedTV covers all the races, so if there wasn't any interest, why bother. if this ol' boy down there in Texas can build a world-class facility for F1, the fans will be there. now all they have to do is get USGP up and running and get Peter Windsor to sign Kyle Busch and AJ Allmendinger the drive the damn things. Cheers to F1s return to our soil! Lets agree to disagree.....F1, amazing cars and drivers, Nascar, amazing cars( for what they do)and drivers! They each hold their own pros and cons! I personally think that the U.S. is the best place to race a vehicle PERIOD!! I like them all. And to Jim, Americans would love V8 supercars, they are some bad pieces of machinery!! Kudos to F1 for trying the U.S market again, and Kudos to Austin,Tx for stepping up to the plate and taking on F1. I think that F1 if properly introduced could gain some American interest (and American drivers) which would bring it's popularity back. I love watching F1 mainly because of it's technical intricacies and the fact that manufacturers are competing against each other (something NASCAR perpetrates). Racing in America has turned into a commercialization behemoth all while the manufacturer development part has all but diminished. F1 would bring back the original purpose of racing to America....development and design to improve the cars we buy. The 2005 USGP would not have been a bomb of an event if Bernie Ecclestone & Max Mosley had allowed a temporary chicane in Turn 13 (indy's Turn 1) for the Michelin teams. Only Tony George's refusal to pay Bernie's ever increasing sanctioning fees ended the race. If the Herman Tilke (Bernie's preferred course designer) builds a good circuit in Austin, Texas people will come. I'd prefer Road Atlanta over an unknown Tilke cookie cutter course in Texas. It already meets international endurance race standards, and it's probably more accessible to high class hotels than some of the other circuits. Metro Atlanta should be good enough for Bernie Ecclestone and F1. If only there was a USA contender. America didn't care about "soccer" until Landon and the team showed up on their radar. Swimming wasn't talked about until Micheal Phelps suddenly arrived. Cycle racing in France was a joke until Lance Armstrong appeared. Get a driver who can compete, wrap him up in Budweiser colours and it will be an instant hit.